News 16.12.07 Finally got to Dull and Logierait parish churchyards at the weekend. Dull had a low count of Kennedy memorials and, like nearby Weem, is dominated by the Menzies family. Logierait had a greater mix of names and was rich in local Kennedy families. The Tom of Cluny family were prominent. News 13.12.07 I now learn that the recent archaeological dig at Culzean failed to find convincing evidence for the former house of Scipio Kennedy at the place marked on the old estate maps. More can be found in the current edition of 'History Scotland' magazine. News 6.12.07: The National Archives in Ireland have released the Dublin section of the 1911 census online. There are 1934 Kennedys listed (including 3 O'Kennedys from Co. Wexford) and the surname ranks about 13th, similar to its 15th placing in the current Eire/Dublin (area code 01) phone directory. Full analysis to follow. News 30.11.07: Celtic's star player John Kennedy is injured - again! After just getting back into the game after years off with injuries, John picked up another injury mid-week at a UEFA match. He could be out for several months. There is better news for author AL Kennedy who picked up the 2007 Saltire Society Book of the Year award for her latest novel 'Day'. More later on this. News 21.11.07: Milestone Two has been completed; the indexing of 'Civil-A' period vital records in Scotland. The next step is to match all these families up with the following 1881 Scotland census. Those missing can then be searched for in other national censuses and emigration records. News 10.11.07: It's been 'Archive Week' at the project. On Tuesday I attended a tour of the National Archives in Edinburgh to see if I could pick something new up (like online WW1 Soldiers Wills); on Thursday I finally got to the Ayrshire Archives on the Craigie Estate where I went through the first part of the extensive Kennedy of Kirkmichael Papers (collection ATD42). It was right at the end of the day when I suddenly noticed collections ATD59/60 with an equal amount of additional papers. More later on this. News 28.9.07: I managed to miss Culzean's archaeological dig for the house of freed African slave Scipio Kennedy earlier in September - more on this when I can find out what, if anything, they found. I did manage to catch up with a slightly more recent Kennedy, when Belfast singer Brian Kennedy performed at the Old Fruitmarket here in Glasgow last night. News 9.9.07: 'Janet Kennedy, Royal Mistress: Marriage and divorce at the courts of James IV and V' by Ishbel Barnes is hot off the presses at Birlinn Books and I picked up my copy today (9.9.07). It's refreshing to read a book about a female Kennedy - is this a first, at least for the Scottish Kennedys? At various stages Janet, the daughter of John, second Lord Kennedy and his second wife, Elizabeth Gordon, daughter of the earl of Huntly, was the wife of Alexander Gordon, the supposed wife of the earl of Angus, the mistress of King James IV and the spouse of John Ramsay. The book is fairly short, partly because there are no writings of Janet herself - it being very unusual fora woman of her time to be able to write. There is an ample bibliography and good source references throughout the text, much of the information coming from Exchequer and other royal court documents. The only Kennedy work apparently consulted is Dunlop (see further down this page); it seems a little odd that no other was consulted, or maybe they are just not mentioned. Moss really only starts his account after Janet's life; there is according to the author no record of her death or for that matter of her birth; her birth is estimated to be about 1480 AD and her death probably in the 1540s. Ailsa, In Memoriam. 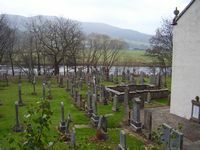 The memorial service was held today, August 23rd, for Mary Kennedy (nee Burn), widow of the late 7th Marquis of Ailsa, at Kirkmichael parish church in Ayrshire. The local minister the Rev. W. Gerald Jones led the service and gave a moving memorial address. The scripture readings were by Andrew Drummond and Lady Rosemary Kennedy, the Marchioness's granddaughter. Mary was born in 1916 and is survived by her three children Elizabeth, Charles (the current Marquis and Chief of the Kennedy clan in Scotland) and David as well as many grandchildren. Donations should be sent to the Ayrshire Hospice, Ayr. Thinking of Scott Kennedy of The Black Watch who was killed in Iraq today, June 28th, 2007, aged just 20. Newsflash! First major milestone completed today, January 6th 2007: complete coverage of Confirmations and Inventories 1876-1936. The entire contents of this website www.kennedydna.com are Copyright © 2007 to Iain Kennedy and may not be reproduced either in part or whole.